In addition to our engines and heads we now supply most of the basic engine components needed for an engine rebuild. And where other companies are having trouble supplying basic engine rebuild parts, our inventory is expanding. For 2017 we will continue to increase our parts options for Volvo B18/B20 engines, and will try to bring back some of the custom parts that have not been available, including aluminum crank pulleys and roller rocker kits. Unless stated otherwise, all parts listed below are for Volvo B18/B20 engines. See the engine section for our bottom end component kits and the Street Performance Tuning Kit which combine many of the parts into cost saving packages. We have increased our stock of OEM type cast pistons in order to provide customers with a source for pistons that are becoming hard to find as many traditional sources in the US no longer offer them or have them in limited sizes. We will try to have a variety of sizes of OEM type cast and forged pistons available. If they are not instock we can usually get them. If you need a piston not listed let us know and we may be able to get it for you. Custom built forged pistons for NA and forced induction applications from street to race. These are the pistons to use for high rpm or other high stress, high heat applications. Some sizes normally in stock. Other sizes available on custom order in 4 weeks. $650 incl. pins, rings and design time. B20 OEM type cast pistons with pins and rings - available in several overbores - .015, .020, .030, .040, .060 - for engines with 6 bolt cranks & 22mm pins - In order to assure availability we often have had to import these directly from Sweden resulting in an increase in price to $385 a set. Several sizes currently available. As piston prices are rising rapidly, prices quoted here are only for those piston sets that we have in stock. New orders will reflect the rising costs. B18 OEM type cast pistons with pins and rings - available in several overbores - .020, .030, .040, .060 - In order to assure availability and quality we have to import these directly from Sweden. Based on the current value of the US dollar and increases in piston prices these are currently in the $500 range per set. Several sizes currently available on a special order basis.Email for price and available based on size. We use several different rods in our Volvo B18/B20 engines. Most of our Street Performance engines use stock rods that have been reconditioned and upgraded with ARP rod bolts. For race or rally engines that will be run at over 7,000 RPM we use various brands of aftermarket forged rods depending on the application. When using custom made rods we take advantage of the opportunity to have them made to the most advantageous dimensions - longer, lighter and with smaller journals than stock. The results are more efficient engines with lighter components. Forged rod and piston kit for 2010, including pins, rings and rod bearings - $1725. Add an offset ground B20 crank with main bearings for a complete 2.3 liter stroker kit for - $2350. Main bearings - Volvo B18/B20 - standard and .010 under - will also fit B21/23 engines - $85 - $100 per set depending on size needed and availabily. All of our Volvo B18/B20 engines, whether for street, supercharger, or race, use very high quality, severe duty, high flow, stainless steel valves. For street engines these are normally 44mm intakes and 36mm exhaust. 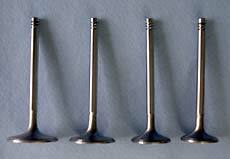 For the typical race engine the exhaust valve size is increased to 38mm. The shape of these valves gives a significant flow improvement. Stock type replacement valves are also available, but why use them. For B18 engines we have guides that allow B18 heads that come with 11/32 stem valves to be converted to the 5/16 stem valves and seals used in the B20 engines. For optimum fit and performance some custom machining of all guides is usually necessary. SS high flow street and race valves, 5/16" stem, necked down for improved flow. Available sized - 42, 44, 46, & 48 mm intakes - 36 & 38 mm exhausts, $26 each. - With custom ground seat and backcut - $32 each. Email for additional prices for your specific application. Our B20 exhaust valve compared to a stock valve. From right to left - a stock spring, a 1.25" dual street performance spring and a 1.44" diameter dual with damper race spring. For Volvo B18/B20 street, rally and race engines we offer a selection of dual and single valve springs matched to your cam and performance needs in various diameters, heights and rates. This includes valve, valve spring and retainer combinations designed for the use of taller, larger diameter springs (up to 1.44 diameter for race applications) needed to provide higher spring pressures, accommodate higher valve lifts, and reduce spring fade and valve float under high performance and racing conditions. Order based upon exact requirements. E-mail for recommendations. Other spring and retainer combinations are available. Our street performance and supercharged engines use dual valve springs 1.25 in diameter. These springs are highly recommended for any engine with a non stock cam. Installation requires a simple procedure to enlarge the spring pockets on a stock head. Since it has to be done while the head is off, it should be done as a routine procedure when changing to a non- stock cam. Matching steel and aluminum retainers are available. Due to more radical cam designs and higher RPM use, our race engines are set up with 1.44 diameter dual springs with damper, chosen for long life in high RPM applications. Modifications required in order to use these springs include - enlarging the stock spring pockets in the head, using an aluminum valve cover with reliefs milled for the springs, and modifying the rockers for additional clearance. Titanium spring retainers are used with these springs. Problems with the stock Volvo B18/B20 pushrod and lifter combination caused us to change these components in our race engines many years ago. Since making the changes we have not had any problems, so we use these new components in all of our engines. The stock pushrods flex, especially in high performance applications using cams with higher than stock valve lift rates, reducing lift and contributing to valve train vibration and instability. To solve this problem we offer high quality performance pushrods to fit various lifter and rocker arms combinations. Available in various lengths, 5/16 is the standard diameter as in the photo below. Stock B20 Pushrod above - our standard Performance Pushrod below. Performance Pushrods for stock B18/B20 lifters - $ 160.00 per set. Performance Pushrods for use with our B18/B20 Performance Lifters described below - $ 160.00 per set. Based on over 30 years of experience in race and street engines and elimination of premature wear issues, we do not use stock Volvo type lifters. Instead we use competition style, US made solid lifters in all of our engines, street or race. Our performance pushrods are required with these lifters. Used with our cams, valve springs, spring retainers and valves, the result is a well tested, reliable combination. New lifters have to be used when installing a new camshafts. Stock Volvo rockers are specified as having a lift ratio of 1.52 to 1, but give an actual ratio of between 1.43 and 1.47 to 1. This results in less valve lift than expected and less than what is specified for the cam you are using. To cure this problem, we have stock rockers modified to provide a true 1.5 to 1 and higher ratios. Stock Type Rockers - While waiting for our new Roller Rockers Kits to become available - see below - time was spent improving results with the stock rockers. They are actually lighter than aluminum roller rockers, and have proven to be stronger and more reliable than most aftermarket rocker arms. The problem with the stock rockers is that the actual ratios vary widely from rocker to rocker, are usually much less than the 1.52 ratio specified, and produce widely different valve lifts in each cylinder and from engine to engine based on individual variations in rocker geometry. We have seen as much as a 12 HP difference based solely on which stock rockers were on an engine. To solve this problem we now test each and "bluprint" each rocker we use in our engines and can provide to customers both matched stock sets and sets modified for higher lift. Equalized Stock Rockers - we no longer offer unmodified rockers as almost all rockers we receive need work to clean up tip wear. Once they are in the jig they are modified both to clean up the tips and improve lift and then are classified based on the resulting lift ratio. See below. Modified Stock Rockers - modified to improve and eqaulize the lift ratio. Matched sets of stock rockers selected and modified to provide sets with equally improved lift ratios. From $150 - $325 per set depending on lift ratio, from "good" to "race" - on exchange or add $75 core charge. Switching to higher ratio rocker arms is like installing a performance cam, higher valve lift and longer effective duration. Roller Rocker Arms for Volvo B18/B20 engines - The New Kit Is Here and Easy to Install. Since the decision to discontinue our old roller rocker kit we have been working on a new one. And now it is expected to be in stock soon. It uses the stock rocker shaft, shaft pedestals, adjusters and pushrods and will eventually be available in several ratios. Kits will initially be 1.54 ratio, with rockers in 1.60 and 1.65 ratios projected to be available at a later date . Installation is simple. Just unbolt the stock shaft, slide off the old rockers, remove the adusters and install them in the roller rockers, then install the roller rockers on the shaft. The only other modification necessary is to change to an aluminum valve cover to provide enough clearance for the end rockers. Price for 2014 - $385. With new polished aluminum valve cover and gasket - $595. Eliminates random variations in valve lift. Similar kits also will be available for MGs and Triumphs. Below is the description of the previously offered kit. Change back to the original in minutes. Most modern pushrod racing and performance engines use roller rocker arms due to their many advantages. In England they have been used on vintage racing and rally cars for many years. We have made these available in the U.S. for use on Volvo pushrod engines. These high ratio (1.6 - 1) alloy roller rocker arms for Volvo B18 and B20 engines are available individually or as a kit. The kit is complete and ready to install. It includes 8 roller rockers, modified shaft stanchions, pushrods, shims, and miscellaneous parts. The only modification necessary to the engine before bolting it on is a slight enlargement of the pushrod holes in the head. This modification must be done with the head off the block. A cast alloy valve cover must be used in order to provide sufficient rocker clearance. Flexing of the stock rocker shaft causes harmful harmonic vibrations and can reduce valve lift significantly under operating conditions. Modifications tested in our racing program have provided solutions and are offered on a custom basis. E-mail for further details. The camshaft determines the engine's characteristics more than any component other than the head. For the engine to perform correctly the cam has to be matched to the other parts of the engine. Changes in displacement, compression ratio, valve size, exhaust configuration, the induction system, the flow characteristics of the head, and how the car is going to be used have to be considered in determining optimum camshaft specifications. Our cams are custom ground to match these specifications based on modern camshaft design concepts. You can save money by purchasing an older cam design that is less expensive because it has been made in large numbers and is sold as a "one size fits all" performance solution, but it will not give the same results. Most of these older design performance cams have long durations in order to increase high end power, necessary to make up for poor head flow, and the result is a loss of low and midrange power. The most common of these are made by ISKY and have not changed since the early 70's. Incredibly, one of our competitors still advertises their street performance cam ( made by ISKY ) using a 1974 review by Road and Track magazine. Does anyone really believe that there have not been significant advances in cam design in the last 35 years? Really? Have they not done any comparative cam testing and development for these engines in the last 35 years? Really? They also offer a street torque cam ( also made by ISKY ) for customers who want low end power, thereby acknowledging that they don't have one cam that offers increases in power across the full, street use rpm range. So before we got into the street cam business for B18/B20 engines the choice in the US market was one cam if you wanted an increase in high rpm power or another cam if you wanted an increase in low end power. Clearly there was a better way, and we have it - cams developed using modern cam design technology, designed by current cam design experts, with continuous evolutionary development based on current street, track and dyno testing. Computer designed lobe shapes with lifts and duration that are different for the exhaust and intake are just some of the features or our cams that are different from the earlier cam designs. We prefer not to quote cam specs and instead recommend cams by application, as the normally published specs are often misleading. The cam that we normally use in our street performance engines has 264 deg of intake duration and 268 deg of exhaust at .020 lift, with .285" lift at the cam and 110 deg lobe centers. But this tells you nothing about the most important design element of the cam - the shape of the lobes. More important than the duration at .020 or .050 lift, is the duration at .100, .200, .300, etc., so just comparing duration specs at .020 or .050 does not tell you anything usefull in terms of being able to compare the performance of cams based on these specifications. Our cams, especially the street cams, are designed to have as little overall duration as possible in order to assure that power and torque increases are produced throughout the RPM range with no loss of low and midrange power. With lobe shapes that open the valves more quickly than other cams with similar low lift durations, they have more duration at mid to higher valve openings, and produce more power than cams listed as having longer durations at low lifts. As the optimum requirements for the intake and exhaust are different, our cams typically have durations and lobe shapes designed to meet the separate requirements of the intake and exhaust. Cheaper cams use one profile for both. The result is that our cams produce power increases over a broader RPM range without sacrificing low and midrange power and torque. We normally stock several versions of our Street Performance (SP) Cam, the Targo Cam, 2 different Street Stroker Cams for large displacement B20 engine, the Supercharger Cam for high boost supercharger applications, and 2 different vintage race cams designed for both low and high compression race engines. Other cam grinds are available on a custom basis to match your engine requirements. With modern computer-controlled production technology it is a comparatively simple process to optimize the cam design to match the specs of the engine it is to be used in. Cams made in small volume, based on modern cam design concepts and tailored to the specifics of a particular engine are more expensive but well worth the price. It takes a little more than a month for a custom cam, ground on a new core. Our cams are Custom Ground in small batches, Computer Designed and Matched to your Engine Specs. Lobe shapes are based on the most modern computer design criteria. We sell cams based on a recommendation for your application, not by listing cam specs for you to browse through. Due to a shortage of new cam cores, and increase in price of those available, the cam prices listed below are subject to change. The heart of our 2 liter vintage race engines - both low ( 11 - 12 to 1 CR range ) and high ( 13 - 14 to 1 CR range ) compression ratio versions available - $315. Nitrided for extra hardness $ 415 - allow 12 weeks for nitrided cams not in stock. Computer designed as needed for your application - $350.00 Nitrided for extra hardness and durability. $450 - allow 12 weeks for nitrided cams not in stock. Including stock C and D grinds, available from $165 and up. We now offer a selection of aluminum crank pulleys for both supercharged and normally aspirated applications. These are CNC machined from 6061 T6 aluminum. 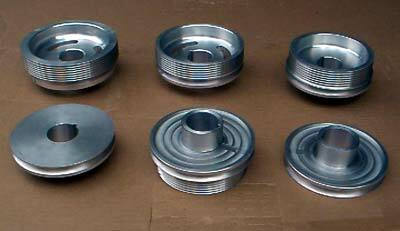 Changing to an aluminum pulley is highly recommended for any racing or high performance application as the stock sheet metal pulleys tend to come apart at high rpms. All are designed to slightly under-drive the alternator and waterpump for power savings. They can be modified for use with crank triggered ignitions. The photo shows the four sizes of pulleys for our supercharger system plus 2 single groove pulleys on the lower left and right of the photo. Cometic head gaskets in stock and custom bore and thickness sizes for Volvo B18/B20 high performance and racing applications . Used in all of our large bore B20 engines. Now available in .027 and .030 compressed thickness sizes. Most stock sizes - $110 - Slightly higher for custom sizes. Gaskets for other Volvo and non Volvo engines also available on a special order basis. Convert your B18/B20 from leaky felt seals to modern silicone rubber seals. We use these seals in all of our engines. 4/11/19 - The above prices are changing due to a significant increase in the cost of the seals - email for details. For those of you who have had problems getting the oil lines to clear the header or just want a better quality adapter than those previously offered, I now have a solution which has eliminated all problems. It is a high quality billet aluminum adapter with the threaded holes for the oil line fittings on the side, not coming straight out from the block. In addition, the adapter can be rotated 360 degrees and tightened in any position. This is a great unit compared to the cheap, cast metal units previously available and has eliminated the oil line clearance problems on my race car and street cars using headers and remotely mounted oil coolers. Comparatively expensive at $85, but well worth the price. Problems with the old type units cost me a race weekend and a set of engine bearings in '98, plus countless extra hours during every engine change. I will never use that type again. To provide for continuous oil flow during racing conditions it is necessary to modify the oil pan to prevent the oil from being forced away for the oil pump pickup by G forces during cornering. We have tested out a simple system of baffles, without moving parts, which has given excellent results over twelve years of racing use. A requirement to ensure a continuous oil supply on the race track or in hard cornering. Baffled pan based on your pan or exchange $125. Where we provide the pan there is a core charge of $75. The truth about oil pumps. Volvo has changed the source for their OEM replacement B18/B20 oil pumps. The country of origin is not specified on the pumps, though the boxes still state " made in Sweden ". They appear to be the same as pumps not made in Europe. Given current choices, we source the best pumps that we can find ( some tend to be better than others ) and do a general check of the pump before sale. However, per instructions in the box, each pump should be taken apart, cleaned and checked before use. Heavy Duty ( heavy weight ) forged pumps - available on special order, email for pricing. Aluminum valve covers can be both a dressup and a necessary performace addition. In most applications they are used to improve the appearance of the engine and make it look special. In certain applications they are needed to provide clearance for larger valve springs and/or roller rockers. The polished valve covers provide more room for large race springs as compared to the black covers which may require further machining for valve springs larger than 1.25 inches.